Fans of the Marvel Cinematic Universe could enjoy a new Captain America during their next trip to Disney. Detailed within a new patent application filed by Disney, a new attraction at Disney theme parks may put guests into the shoes of Marvel’s Captain America. The patent details a physical rail that would attach to the guest’s forearm as well as a physical shield that slides along the rail. When a guest attempts to throw the shield like Captain America, the physical shield will slide to the end of the rail. Utilizing a motion sensor on the rail, a virtual reality shield would appear in front of the guest and travel in the direction of the throw. 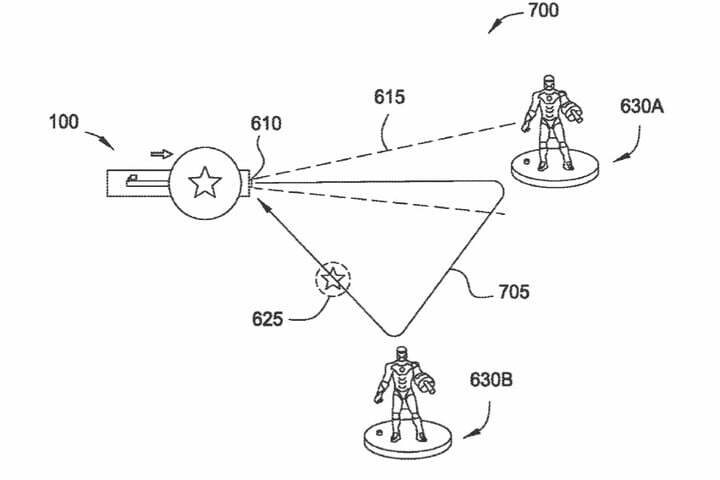 Similar to the Marvel movies, the VR shield would appear to “boomerang” back to the user if the target was hit. This would likely reset the physical shield on the rail for the next throw or for a defensive position to block attacks. Some targets within the attraction will be more difficult to hit. For instance, a super-villain like Red Skull would likely be more difficult to take down than a simple Hydra agent. It’s possible this attraction will be similar to Disney’s Toy Story Mania, a ride that lets users shoot virtual reality darts and rings while wearing 3D glasses. Guests would simply board the Marvel themed ride and throw the shield at enemies when stopped at each storytelling event. It’s not surprising that Disney is taking advantage of more Marvel characters within the theme parks. Starting during late May, the “Avengers Training Initiative” at the Disney California Adventure park puts on a live, interactive stage event for young kids. In addition, Disney has incorporated the Guardians of the Galaxy franchise into the park already with the opening of the Mission Breakout attraction; previously known at the The Twilight Zone Tower of Terror. The new theme includes an original story directed by James Gunn as well as appearances from Chris Pratt, Zoe Saldana, Dave Bautista, Benicio del Toro, and Bradley Cooper (the voice of Rocket Raccoon) in the filmed segments. Sweet! I'd like a crack at that! I don't know how you do it, but you always have a song/video ready to post! This looks awesome. VR is going to be truely revolutionary in the next few years.